The top of Austin is here. The Penthouses at The Austonian are one-of-a-kind blank canvases above everything else in Austin. 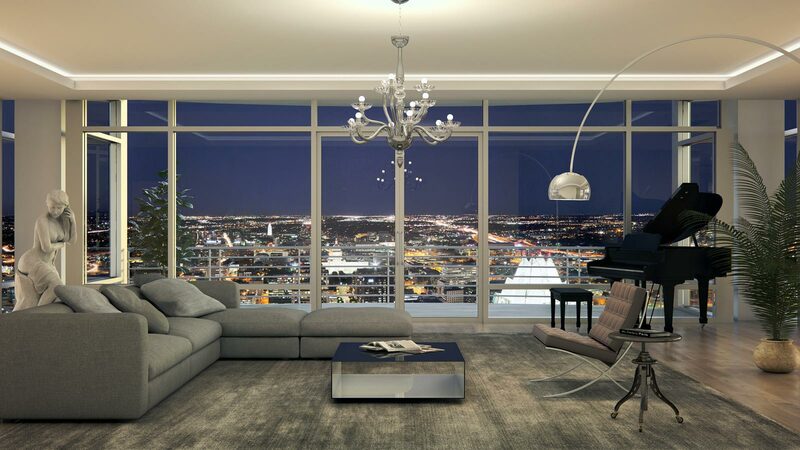 Penthouse owners have the unique freedom to create their own individually tailored home in the heart of the city, all while enjoying the iconic luxury lifestyle that only The Austonian can provide. 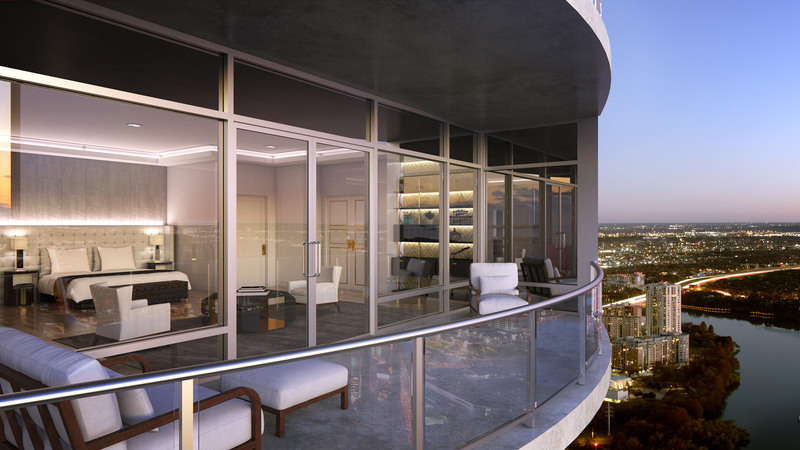 Floors 51 and 52 are each full-level residences ready for customization. Ample square footage means more possibilities in these designer-ready units, each offering unmatched views of downtown and the surrounding Hill Country. Residents can create a custom home at the corner of Congress Avenue and 2nd Street by bringing in their own preferred designer or choosing to work with one of The Austonian’s design partners. Floors 53 and 54 are home to Austin’s one and only two-floor penthouse. This completely unique residence at the height of luxury is ready for immediate customization. A blank slate in the sky, the penthouse offers residents the opportunity to work one-on-one with renowned architect and artist Ryan Street to craft this gracious space in the middle of downtown Austin. With New York City’s The Carlyle Hotel as the inspiration, this sweeping space offers the rare opportunity for several varying microclimates within the same home. Exposed steel, full panes of glass, and walnut floors throughout give the penthouse’s interior a simple, clean, and refined look that enhances the views of the hill country and the State Capitol. Experience layers of sanctuary from the contemplative, soft south side of the home to the dramatic west side and the simple, transparent north side. 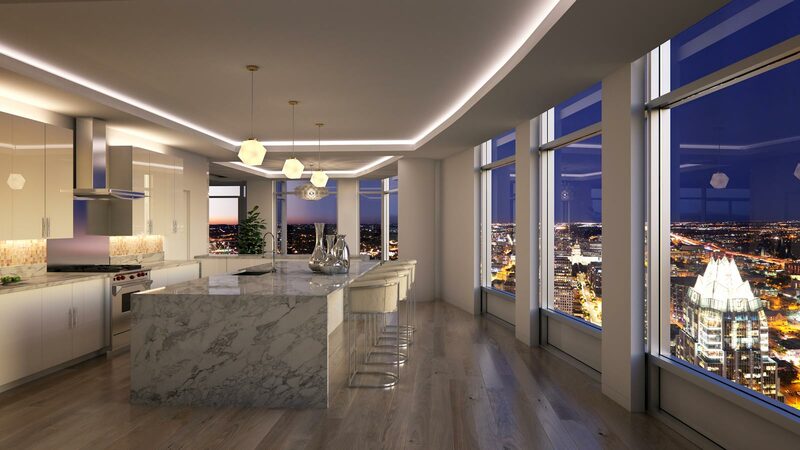 The magnificent rooms of this one-of-a-kind penthouse occupy spaces based on the personality of the views through clean lines and subtle simplicity. 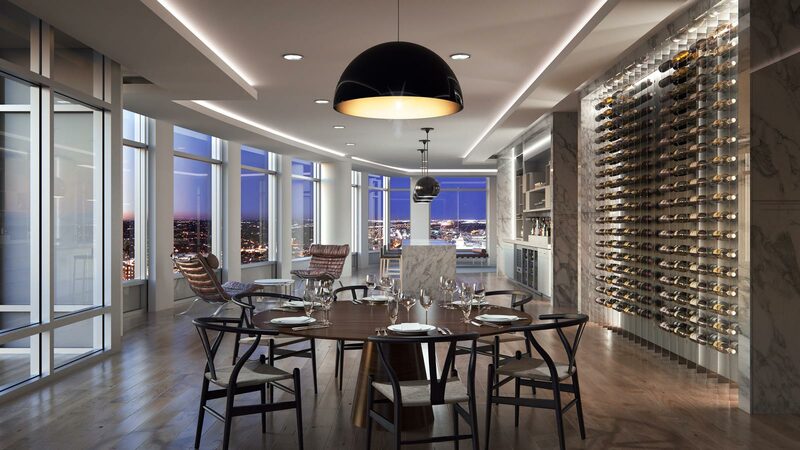 Like the city itself, this Austin penthouse allows residents to take off their shoes and relax while still enjoying a sophisticated dinner and evening. The penthouse’s master bedroom is located on the south side of the building. The quiet, tranquil nature of this space is perfectly complemented by its grandiose views of Lady Bird Lake. The penthouse’s first floor bar features simple, transparent architecture, highlighted by the room’s exquisite glass wine rack. This north-facing room conveys the concept of a long, sophisticated view with a full panorama of the hill country and the Capitol building. Water is the inspiration for this gracious master bath. The marble floors, slipper tub, and floor-to-ceiling windows set the stage for a luxurious evening bath in view of the lake. This north-facing lounge offers sweeping views of the Capitol building and The University of Texas tower. The lower-level resident kitchen embodies the natural simplicity of the penthouse architecture. With views overlooking the rest of downtown Austin, the kitchen features marble countertops and an island bar perfect for casual family affairs.